ALIAWest, Public Libraries WA (PLWA) and the State Library of WA are pleased to invite you to attend this year’s Kay Poustie Scholarship report back event. 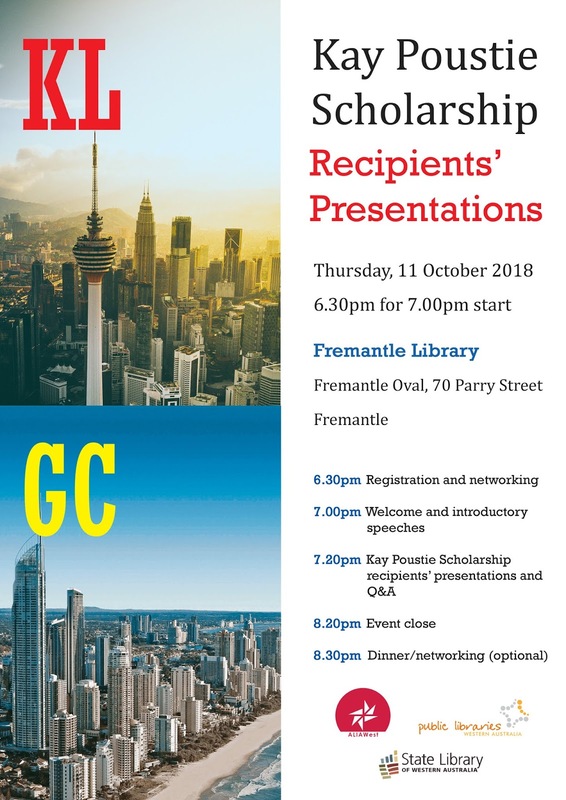 The scholarship winners will be presenting on their experiences attending the recent APLIC and IFLA conferences and encouraging discussion for those who have always wanted to experience one of these conferences but have not yet had the opportunity. RSVP: To Steve McQuade (stevem@fremantle.wa.gov.au) by COB Tuesday 9 October for catering purposes. There will be drinks and nibbles from 6.30pm and we would encourage people to continue the conversations after the event by heading out for dinner in one of the nearby pubs/restaurants.